iTunes does something that radio hosts used to do better; it creates a collection of music for you to listen to. They call it a genius mix, but their genius has a one-track mind. It’s fine if you like only one kind of music, but I like variety. I like lots of colours in my wardrobe, I like both annuals and perennials in my garden, and I like both music and talk on my radio. Not only that, but I like lots of different kinds of music and lots of different kinds of conversation. When I was a child, we listened to the BBC. That’s all there was to listen to, and it had something for everyone. If you didn’t like something, you didn’t find another radio station. You waited a couple of minutes. In this way I heard all sorts of music and commentary that I might never have chosen. I experienced everything from opera to the Goon Show. It broadened my understanding, my musical experiences, and my sense of humour. While there are still some of those radio stations around, most have succumbed to the “genre-fication” of the radio world. Listeners have to decide which genre they prefer, find a station that plays that genre, and then they can listen to nothing but that genre. I have satellite radio in my car, and if I don’t want to listen to Oprah talking to unhappy people for ever I have to switch to a different channel. Even on a very long journey it’s impossible to scan through the dozens of channels available, and every one of them is genre-specific. Even within a genre, there is usually a very specific target audience. Talk radio, is either right- or left-wing. Those people don’t talk to each other. In some rural areas of north America, all the local stations play country music. There’s nothing wrong with country music, but there is something wrong with there being ONLY country music. Listening to a single genre is a bit like being born into the Westboro Baptist Church. How can you know if what you are listening to is good or bad if you never hear anything else? Last week, I drove from San Jose, California to Red Deer, Alberta and I listened to a lot of radio. In addition, I had previously downloaded lots of podcasts of The Laughing Face radio show from CJSR in Edmonton. While listening to it I heard multiple musical genres from all over the world. It was delightful. Sadly, that show is coming to an end, but I’m glad I heard it. 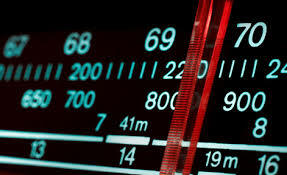 It took me back to the radio of my childhood, and it opened my mind to unfamiliar sounds. I didn’t always like the music on it, but I only had to wait a couple of minutes and there was something different. I understand why it is convenient to air only narrow musical and radio genres. They simplify broadcasting and, presumably, satisfy customers. What this system can’t do, though, is introduce us to music and ideas we don’t know about, and that is a great loss. It’s never enough, is it?